Welcome to the very special #celebrating4years with Mama Elephant Design Team blog hop! Check out this year’s promo! Take 10% off the entire store. In stock items only. No rain checks. No coupon code needed. All prices as marked. Spend min $100* — get a free ‘Just a Note’ 4×6 stamp set. 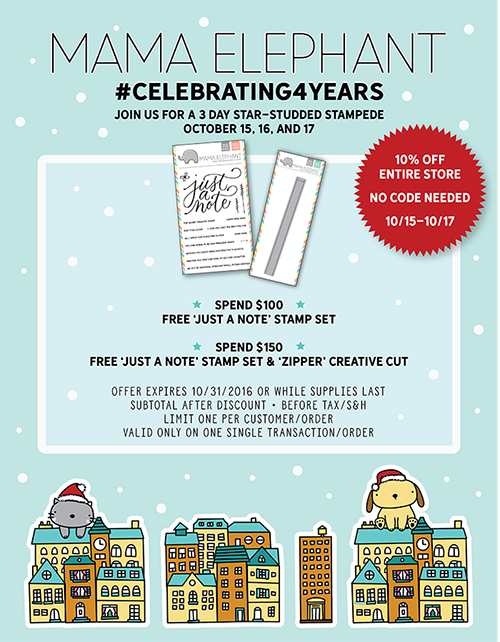 Spend min $150* — get a free ‘Just a Note’ 4×6 stamp set and ‘Zipper’ creative cut die. Subtotal minimum amount must be met before any shipping fees/tax/customs. Free item(s) will be automatically added to your cart. Free item(s) valid only a single order. Orders cannot be combined. Limit one free offer per customer/order. Free offer valid 10/15-10/31 or while supplies last! For today’s blog hop day I prepared the card where I combined two new stamp set — Meowy Woofmas and Merry Mantle. The first one with cute puppy and kitty is my favorite on this release! I like everything about it and I want to use the kitty everywhere! This is almost-one-layered-card (well, actually it has two layers, but the stamped images are flat). It tells the story about the pets who waited for Christmas and destroyed it!))) The cat dropped the cookies from the fireplace and the dog ruined the stockings! I used only masking here and misti tool to build the scene. At the end I added the blending with Distress inks and sprinkled with the water. And at the end I stamped the sentiment (some satire is here — it tells about the piece lol!) and cut off the edges with All Prettied Up — Creative Cuts. My second card for today is made to showcase Just A Note stamp set and Zipper Creative Cuts that go for free for orders over $100 and $150 (see the promo banner at the beginning of the post). Here I again used cuties from Meowy Woofmas stamps set! My first thought for this set was to put the kitty to the moon! It’s easy peasy to make the moon like this — you just need two circle dies, it’s better if one of them is smaller. I used the circles from Framed Tags — Columbus Circle — Creative Cuts and then colored it. Have a good day and amazing blog hop! To celebrate this mega anniversary release, up for grabs are three $25 gift certificate to the ME store! That’s a total of 9 winners for the 3-day Stampede! Winners will be chosen at random from the collective blogs in the Stampede. Winners will be announced on the last day of Stamp Highlights. You have up to 4 chances to qualify to win! We have so many amazing guest designers joining for for this Stampede. It’s a long list so we’re breaking it up into 3 days so everyone gets some love. Here are today’s designers, make sure you ‘stampede’ your way through all of them and check out what they created with the newest products! Remember to come back tomorrow for MORE! Adorable critters! Love the cat on the moon! Anna, these are so adorable and I love the blended backgrounds you made too, so cute!!! Both of these are so pretty and cute! Your Distress Ink backgrounds are AWESOME! 1. Wow! Amazing cards and release!!! Такие классные!!! Этот набор очень милашный, так мне нравятся эти зверьки. Первая сценка просто Умора;)) реальность всех владельцев животных. И сделано очень красиво и технично. С зиппером тоже очень классная. Так мне нравится комбинация синего фона вверху с белым низом. Enjoyed your cards today with somewhat non-traditional colors. Such cute cards!! I love your mantel scene! It’s a constant thing with 3 cats in my house. Perfect! So, so cute ! I really love the Zipper die, the Merry mantle stamp and the big sentiment «just a note». Thanks for sharing so beautifully ! Fantastic cards & lovely coloring! Two beautiful cards. I love that big script just a note!! Adorable cards! Love the «top secret message inside» stamp! Wowww! Fantastic cards! I love the colors and the shades! Gorgeous!! What pretty backgrounds! I LOVE the kitty on the moon!! I liked and shared ME’s Stampede on Facebook. I follow ME and tweeted on Twitter. I follow ME and reposted on Instagram. Cute cards…..love the cat hanging out on the moon! What cute cards. I love the cats and dogs. Wonderful colouring. So gorgeous cards! excellent technique I loved all of them. So sweet!